American historian and foreign policy commentator Robert Kagan, the cofounder of the neocon central organ Weekly Standard and of the Project for the New American Century, tries to answer these and other provocative questions—such as this one: What would the world look like if America were to reduce its role as a global leader in order to focus all its energies on solving its problems at home?—in his new book, The World America Made, available on February 14, 2012. I am sure it will be a worthy read. I say this for a couple of reasons. 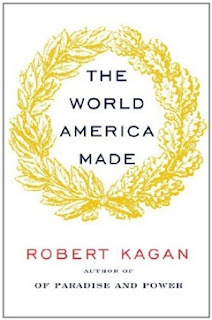 First Robert Kagan is one of the most influential strategists of our time, and the best-selling author of many books, including The Return of History and the End of Dreams (2008), Dangerous Nation (2006), and Of Paradise and Power (2003). Second… I’ve already read “Not Fade Away: Against the Myth of American Decline,” an edited excerpt from the book in the February 2nd issue of The New Republic. That being said, I’ll let you know in a couple months. Have a good read!